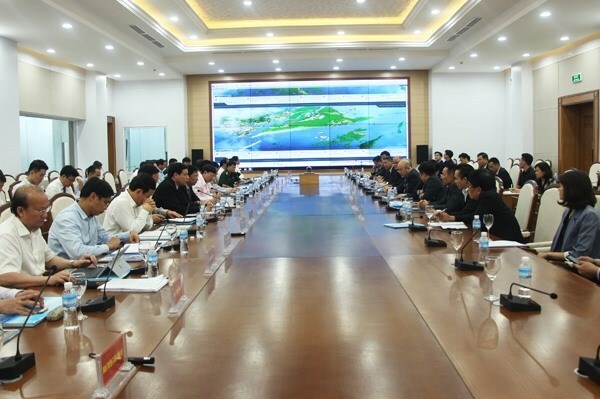 Quang Ninh (VNA) - Businesses proposed to develop three large-scale projects, expected to cost about 10-15 billion USD, in Van Don special economic zone during a recent meeting with Quang Ninh’s leaders. They include Vision Transportation Group (VTG), Hai Dang JSC, and Sunny World Property Development Corp, according to the province portal. Three mammoth projects recommended at the meeting were the expressway linking Mong Cai and Van Don, the Hon Net - Con Ong seaport, and the urban complex in the north of Cai Bau island. The urban complex in the north of Cai Bau island will include a residential area and shopping and service areas on 5,000 ha of land. It will be connected to Van Don Airport and railway station and the Van Don Heritage road in the southern part of the island. Meanwhile, the Hon Net - Con Ong seaport project, worth 1.2 billion USD, will span a total area of 500ha. The construction of the port system would be done in phrases. In the first stage, a wharf with length at 350 – 400 meters will be developed to accommodate the 150,000 DWT (Deadweight Tonnage) vessels. The third, Van Don- Mong Cai highway project, will have a length of 100km, connecting Mong Cai border gate with Van Don special economic zone with central station at urban complex in the northern part of Cai Bau island. It will be used for passengers and improve transportation.